It's a universal truth—anywhere there are exotic cars, there will be exotic car crashes. The Netherlands are certainly no different. 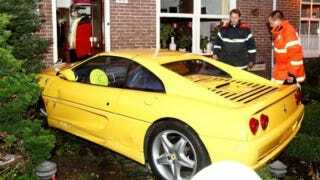 The Dutch owner of this bright yellow Ferrari F355 GTS drove it into a brick house Friday night. According to GTspirit, where we found this picture, the crash occurred in Den Dolder near Utrecht, The Netherlands. Although the damage to the car and the house were extensive, no one was injured in the crash.